Come close out your 4th of July weekend with the Cause A Scene crew at the first house show of the month, back at good ol’ 5008 Longstreet Drive. 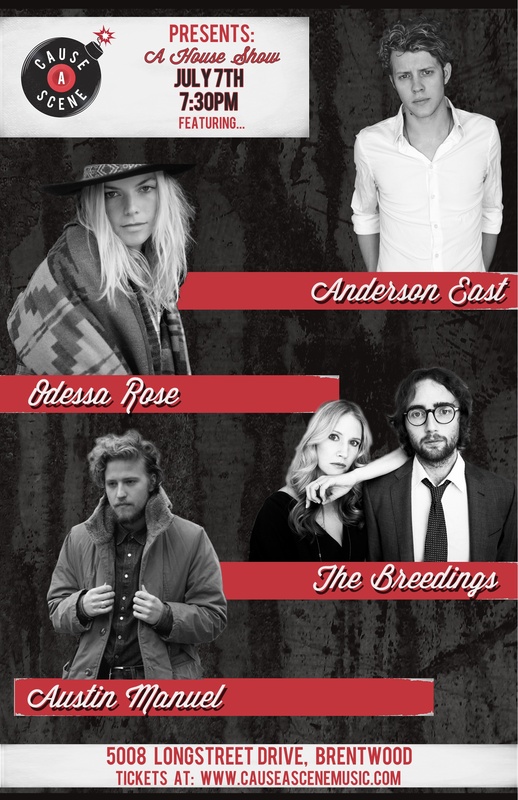 The night will be filled with a wide range of music spanning from the Americana/soul sounds of Athens, AL native, Anderson East, to the brother/sister duo, originally from Lexington, KY, The Breedings, who are bringing back old school country and classic rock n’ roll, creating a refreshing, hybrid concoction. Both artists are Nashville transplants and both are on opposite ends of the touring and creative spectrum. Anderson East has spent the last several months touring and promoting his 2-disc concept album, Flowers of the Broken Hearted, which released last fall, while The Breedings have spent the better part of a year writing and recording their sophomore record, Fayette, due out soon. The evening will also include the angelic voice of Odessa Rose and the folk stylings of singer-songwriter and Nashville native Austin Manuel, who is also fresh of the release of his 12-track album, Through The Night, that he finished this spring. You can purchase tickets here for $7 in advance and $10 DOS. Doors at 7:00 PM. Show starts at 7:30 PM.